Post Scriptum: There was a lot of interest (as far as this blog's level of activity goes) around what in the world a vacant house actually is. The gut reaction for many folks, including myself, was that vacancy is a pretty clear indicator of economic decline -shuttered houses left to rot. BUT, mixed in with that very real set of feral houses are houses that are vacant because times are good: vacation or seasonal homes whose owners happened to be occupying some other abode at the time of census canvasing (you can, after all, only be in one place at a time). Also, there is the more neutral condition of a home that is about to be moved into. I found this crusty old PDF to be the best description yet. So, the characteristic of these houses is pretty broad and not necessarily negative. But whatever the reason, they were deemed vacant -and this is a map of that deeming which you can take for whatever it is worth. Double Post Scriptum: It sure would be great to find a clear, unified, un-obfuscated set of HVS data for counties, in order to break these phenomena out. "...houses that are vacant because times are good: vacation or seasonal homes whose owners happened to be occupying some other abode at the time of census canvasing" - I like how you pointed that out. I'm one of those people who move everywhere, but since I'm a woman with A LOT of needs, I stored all my stuff in the most accessible self storage units located at the center of the state. So whenever I'll be needing something during my stay at the other house, I can just drop by and pick them up. And it's convenient for me because I've been moving anywhere I feel like going. Then, there should be a clear definition of what the reasons these houses are vacant. A study should also be conducted that includes why people would opt in renting a house instead of buying them. Such studies will not just identify reasons why houses are left to rot, why people opt to rent a house and its implication on the real estate business. I'm curious as to how the size of the boxes on this maps was determined. For example the boxes in northern Nevada seem larger than normal. I'm assuming it's per capita? I wonder how this would compare with similar records of people moving into or moving out of an area. 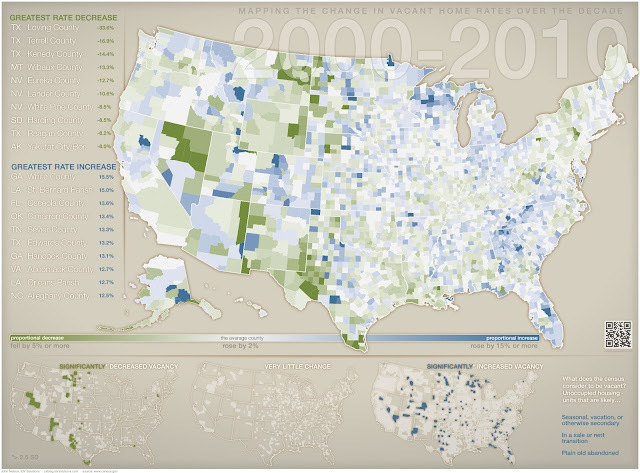 There may be vacant homes, but this does not include new home construction.